Lately, there has been much debate in the analyst community about the definitions of "tablet" and "market share" as that reported by research firms. One of the primary arguments is that usage patterns of low-end, white box tablets are very different from those of high-end devices like the iPad. While this is certainly a valid argument, I believe it misses the larger point relating to the competition between products at various market tiers. The image above shows the distribution of tablet buyers (potential and current) among various tiers and the key products/competitors at each tier. The size of the addressable market reduces as we move from low-end consumers to enterprise customers and the dominant use cases change from basic media consumption to apps/games/services and, finally, to productivity. However, these market tiers are not defined by price (which is the popular perception), but by usage patterns. While purchasing power increases in higher tiers, product pricing itself is a factor of evolving competition. Over time, customers from the same market tiers could move to cheaper products if they fit their requirements. 1. 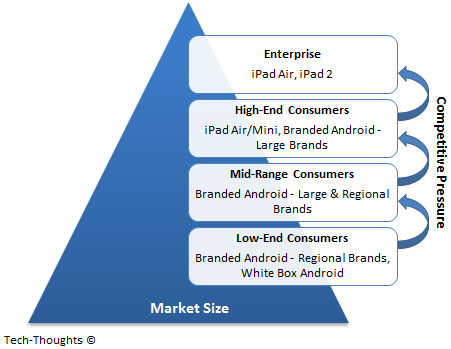 Low-End: The low-end market is mostly dominated by Android tablets from white-box vendors and low-end regional brands. The primary use case for these devices is basic media consumption and online activity is limited. The undifferentiated nature of products results in extremely narrow margins, very similar to the pattern seen in this tier of the smartphone market. Some analysts have dubbed these products the "feature phones of the tablet industry", a characterization that is mostly accurate. However, they have completely ignored the competitive threat from these vendors to players in the next tier and the ripple effect up the following tiers. 2. Mid-Range: The mid-range market is characterized by use cases related to media consumption and light online activity (social networking, browsing, etc.) 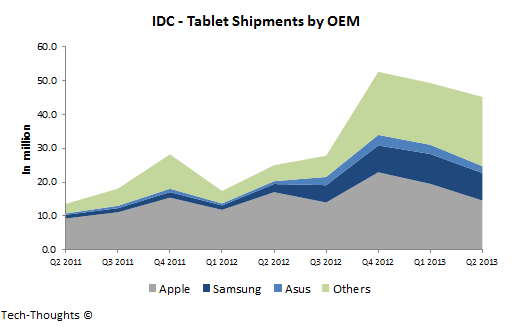 and is mostly dominated by Android brands - both international and regional ones. One of the common errors analysts make is to assume that a few large OEM brands are the only ones relevant to competitive analysis. In reality, the tablet market is extremely fragmented by region - for example, Micromax and Karbonn are two of the largest tablet brands in India. These companies were minor players in the low-end market, until they began their upmarket move by increasing their marketing and branding efforts. Since margins here are quite a bit higher compared to the low-end market, it motivated low-end players to enter this tier with improved products. By targeting the most price sensitive customers of larger Android brands, low-end vendors have increased pricing pressure in this tier. In response, larger brands have looked to higher tiers to maintain/increase margins. 3. High-End: The high-end market is characterized by usage patterns ranging from heavy online activity, gaming and other apps/services. As a result, the availability of apps is one of the primary criteria for purchase. Unsurprisingly, this market is primarily dominated by Apple's iPad range and leading Android vendors like Samsung, Asus and Amazon. Interestingly, last year's launch of the cheaper iPad Mini didn't really help Apple go downmarket, but cannibalized sales of the regular iPad to consumers in this tier. This was because the iPad's strengths (app availability) weren't as valuable in the mid-range segment, when cheaper, "good enough" tablets were already available. On the contrary, it held tremendous appeal for the high-end tier as it offered most of the benefits of the iPad experience at a lower price. However, in response to price competition at lower tiers, larger Android brands have been invading this segment. Armed with an improving app selection, these brands have targeted Apple's "most price sensitive customers". In turn, Apple has responded by maintaining prices and attempting another upmarket move. 4. Enterprise: The enterprise market requires stringent security requirements and a wide range of productivity-focused applications and services. In the most recent product refresh, Apple moved to 64-bit architecture to cater to the requirements of enterprise users. It is interesting to note that the price of the iPad Air isn't any higher than the previous "high-end market" focused iPads. This is because competitive intensity successively pressured the ASP in lower tiers, leaving the highest priced product to the enterprise market. Samsung is attempting to enter this tier as well, but for now, their products are still lacking compared to the iPad. Studying the interplay between market tiers shows us that the effect of price competition from low-end, white-box vendors is felt even in the highest tiers of the market. While players at each tier may attempt to "flee upmarket" to successively smaller markets, that is just a temporary solution as competitors are motivated to attempt the same. Given this pattern of competition, it is no surprise that Android tablets have a smaller, but rapidly growing share of global tablet browsing. These competitive dynamics aren't very different from what we saw in the smartphone market, except that the nature of subsidized pricing created 2-3 separate markets. While each market saw different players in each tier, the nature of upmarket competition in was largely similar outside the US. Understanding market tiers and upmarket moves also helps explain weak demand for Windows 8/RT tablets (apart from their obvious shortcomings in terms of design and ease of use). While they were priced to cater to high-end buyers, the lack of apps on the Windows tablet platform made them a better fit for lower market tiers.